Easily one of Africa’s most imposing magnetisms, the Kruger National Park spans an area comparable to that of a smaller country and is the largest national park in South Africa. With so much to see and do, we’ve compiled a list of the top highlights at the Kruger National Park. Come face to face with the strong Kruger kudu, a tall and mighty beast. The kudu’s stripes help to disguise and guard them from predators and the male’s horns can grow as long as 2 meters. Where else could one imagine watching Cape buffalo locking horns and butting heads than the mighty Kruger Park? And of course, visitors will get the chance to see the kings and queens of the jungle in all their natural glory. 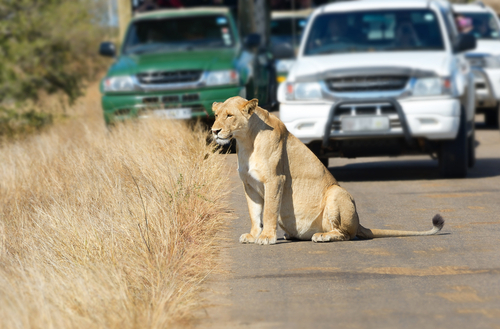 From an open safari vehicle, catch a glimpse of lioness in search for their prey while their male mates await a tasty catch and cubs frolic in the African heat. The Kruger National Park is home to an abundance of fascinating birdlife, too. Particularly the ground hornbill, identifiably by the male’s red wattle. Don’t forgot to bring binoculars to try and identify as many species as possible. After a day of safaris, visitors can stop off under the shade of an enormous baobab tree and sip on a glass of native Amarula while watching the African sun sink into the bush. Bushmen believe that the baobab tree offended its Creator and in revenge it was planted upside down – that’s why it has a root-like canopy. Accommodation at the Kruger Park is nothing short of world-class luxury. Lodges offer all the comforts of a 5 star hotel along with exquisite local fare and the chance to spot the likes of elephants and the rest of the Big 5 freely passing by. The average day at a safari lodge begins with a three hour game drive before the sun has risen, followed by scrumptious breakfasts, a day of relaxation next to a sparkling pool, afternoon high teas and three hour sunset game drives. There are also nocturnal safari trips to see the nightlife come out. There are various ways to reach the Park. Many visitors choose to fly into O.R Tambo International Airport in Johannesburg and then drive the 600 km to Orpen Gate. The southern section of the Park is easier to access from Johannesburg but it can get exceptionally busy during holiday season. Another option for getting further north into the Kruger is to fly into Nelspruit. The best time to head to Kruger for walking safaris and game viewing is during the drier winter season between May and October. The vegetation is low and sparse during winter, so it’s easier to spot and follow animals and the permanent water sources make for rewarding game viewing. After the summer rains in November, the Park comes alive with thriving green landscapes that make for incredible photo opportunities. There is still the opportunity to view game and with a lot of the younger summer-born animals around, the Park is a predator’s paradise. It’s also the best time for bird watching. This is a malaria-rife area so visitors do need to take prophylaxis during their stay. Bring along sunglasses, sunscreen, a hat and a pair of binoculars. Don’t forget the camera. To book your Kruger Park experience, get in touch with our agents.